Rural Development Sociologist specialized in agrarian transformation processes in Africa with an emphasis on rural poverty, land reform, small scale farming, technology development and social change, endogenous development and rural livelihoods. Over the years, he has done substantive fieldwork on socio-technical dimensions of maize and soil fertility (re)production in Kenya and land reform in South Africa. 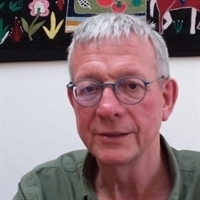 Theoretically he combines actor perspectives with broader questions related to political economy.He supervises a substantial number of MSc and PhD research projects and is external examiner and reviewer of journals. He is also member of the Netherlands Committee of the South African Netherlands Research Programme on Alternatives in Development (SANPAD). In 2006 he is appointed adjunct Professor at the University of Fort Hare, Alice, South Africa. See also: http://www.rds.wur.nl/UK/Staff/hebinck. 2018 - Veldwisch, G.J.A. ; Borsboom, V.; Ingen-Housz, F.J.M. ; Zwarteveen, M.Z. ; Post Uiterweer, N.C.; Hebinck, P.G.M. 2016 - Medard, M.; Dijk, J.W.M. van; Hebinck, P.; Geheb, K.
2015 - Odendaal, W.; Hebinck, P.G.M. 2014 - Averbeke, W., van; Manyelo, K.; Hebinck, P.G.M. 2014 - Manyelo, K.; Averbeke, W., van; Hebinck, P.G.M. 2013 - Hebinck, P.G.M. ; Faku, N.
2013 - Hebinck, P.G.M. ; Cousins, B. 2011 - Hebinck, P.G.M. ; Shackleton, C.
2011 - Leynseele, Y.P.B., van; Hebinck, P.G.M. 2010 - Hebinck, P.G.M. ; Fay, D.; Kondlo, K.
2008 - Hebinck, P.G.M. ; Marais, F.; Moseki, M.
2007 - Kiptot, E.; Hebinck, P.G.M. ; Franzel, S., dr; Richards, P.
2006 - Brussaard, L.; Hebinck, P.G.M. 2006 - Hebinck, P.G.M. ; Fay, D.
2006 - Kiptot, E.; Franzel, S., dr; Hebinck, P.G.M. ; Richards, P.
2005 - Place, F.; Adato, M.; Hebinck, P.G.M. 2004 - Place, F.; Hebinck, P.G.M. ; Adato, M.
2003 - Place, F.; Adato, M.; Hebinck, P.G.M. ; Omosa, M.
2003 - Hebinck, P.G.M. ; Place, F.; Omosa, M.
2002 - Hebinck, P.G.M. ; Bourdillon, M.
2002 - Hebinck, P.G.M. ; Place, F.; Adato, M.; Omosa, M.; Ontita, E.
2001 - Hebinck, P.G.M. ; Mango, N.
44. Rural households and livelihood strategies: straddling farm and nonfarm activities. 1998 - Hebinck, P.G.M. ; Ruben, R.
45. The significance of land tenure reform in Kenya: lessons for South Africa. 46. Book review: The seed is mine. The life of Kas Main, a South African sharecropper 1984-1990. C. van Onselen. 47. Technology and agrarian change: a case study of Western Kenya. 48. Irrigatie en sociaal-culturele veranderingsprocessen in Nyamaropa, Zimbabwe. 1997 - Hebinck, P.G.M. ; Magadlela, D.
49. Dynamics of agricultural production. An analysis of micro-macro linkages. 1997 - Hebinck, P.G.M. ; van der Ploeg, J.D. 50. Formal and informal knowledge networks in conservation forestry in Zimbabwe. 1996 - Hebinck, P.G.M. ; Hanyani-Mlambo, B. 51. Opening the Black Box: farmers redesigning zero grazing technology in Western Kenya. 52. Intervention and the black box: maize farming in Nandi District, Kenya. 53. Dry fields and spirits in trees - A social analysis of development intervention in Nyamaropa Communal Area, Zimbabwe. 1995 - Hebinck, P.G.M. ; Magadlela, D.
54. De sociale constructie van de Afrikaanse gemeenschap. 55. Boekbespreking: Coping with semiaridity. How the rural poor survive in dry-season environments, H. Reitsma, T. Dietz, L. de Haan (eds.). Inst. Sociale Geografie, Amsterdam. Ned. Geografische Studies 195 pp. 58. Thema: Technologie, kennis en verscheidenheid. 1990 - van der Ploeg, J.D. ; Hebinck, P.G.M.